I decided to make a third reef for Cream Cheese in May. 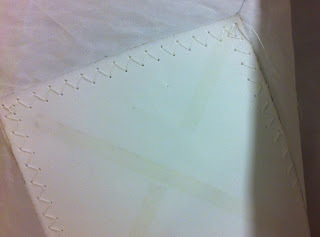 It has been 12 years since I sewed the sail, and I wasn't looking forward to re-learning all of the special sail sewing techniques. As it turned out, it was a fun project. The first step was to pull out my copy of "Sailmaker's Apprentice," by Emiliano Marino, and re-read a few relevant chapters. Then I ordered the cloth and jiffy grommets from Sailrite. Next, I spread the sail out on the floor to plan the location and size the various panels that would be sewn together to make the reef patches. I did this by taking off the dimensions from the existing patches. At this point I was ready to cut the panels. My reading indicated that scissors aren't the best for cutting dacron sail material because the cut is more likely to fray under heavy use. A hot knife is the preferred method, but I wasn't going to fork out $400 for an industrial hot knife. I settled for attaching a rope cutting blade to my soldering iron (with a little modification). The edges were a little rough, but it was good enough. 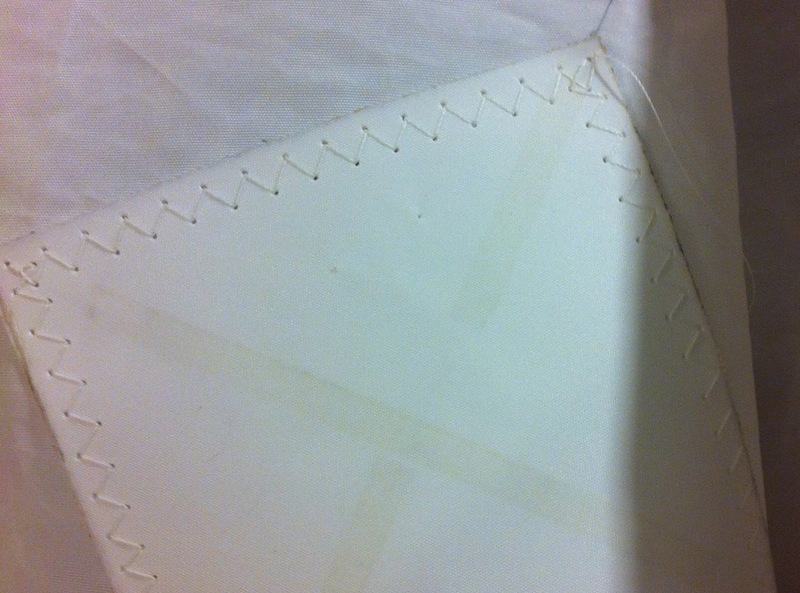 I had to redo all of the cringle patches because I got the weave orientation wrong (see "Sailmaker's Apprentice"). 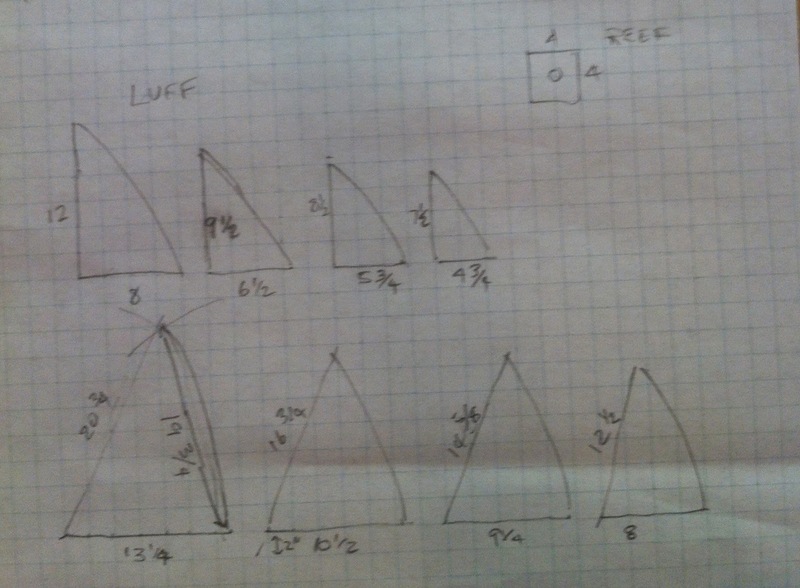 Each reef cringle patch is 4" square. There are two patches for each reef patch and the fabric weave should match the weave of the sail at the point of attachment. 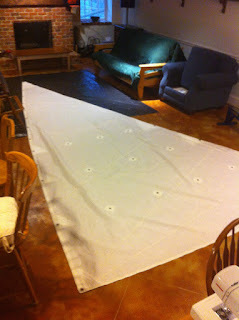 I used basting tape to assemble the clew, tack and cringle patches and then put them aside. Now I was ready to start sewing, but before I could do that, I needed to freshen up on my sewing skills and make sure the needle, thread and machine were going to be able to go through seven layers of dacron. This probably took more time than any other part of of the project. My sewing machine is a Janome 7330, which is a "home decor" machine. It comes with a two kinds of zig-zag stitches, has a pretty good motor and a fairly strong feeder. I discovered that this machine with a #90 needle will do a zigzag seam on five layers of 4oz dacron, but not on seven layers. It works fine with a #110 needle but but I was worried that the holes in the fabric were a little too large. 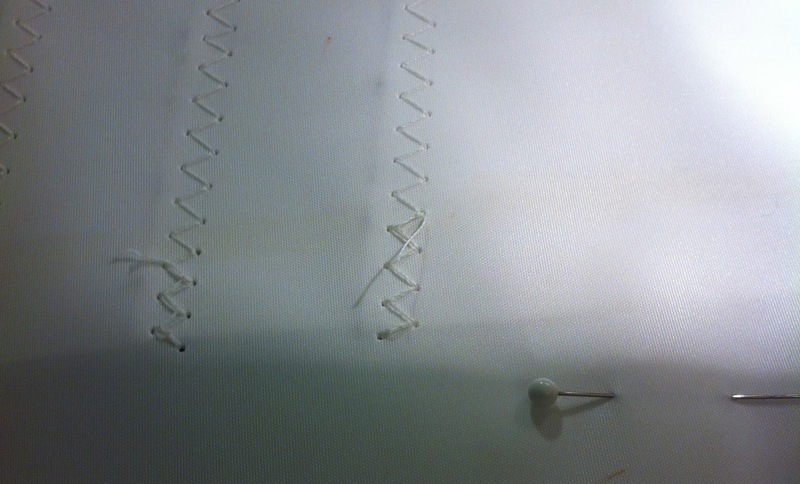 After talking it over with a few people, I decided to go with the #110 needle and larger holes. I've been happy with the results. Janome 7330, basted reef patches, practice patch. Now I was ready to sew! This part of the operation went relatively quickly. 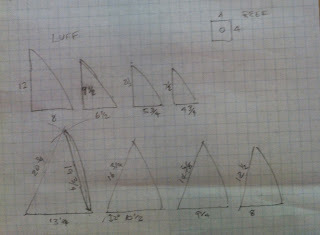 First, I cut loose the luff tape (seam along the luff of the sail) and pinned the pre-assembled reef patch to the sail. Then I rolled up the excess material and started sewing. Once the tack and clew patches were sewn on, I pinned and sewed each reef patch. Now that all patches were on the sail, the last step was to install grommets. The reef grommets were the easiest. Simply, cut the hole with a 3/8" hole punch and install the #2 grommet with the two part die set. Installing the sailrite jiffy grommets on the clew and tack were a bit trickier. A jiffy grommet is comprised of two washers that are attached to the sail using six aluminum rivets. The kit came with no instructions and there is very little on the web about the best way to do it, but I'm pleased with the results. Now the third reef is finished - I can hardly wait to try it out in heavy weather.